Maximize versatility with this full-feature printer. Exceed client expectations with production speeds ideal for handling urgent jobs. The HP Latex 365 Printer produces indoor and outdoor prints on a variety of traditional signage substrates - even textiles. And high-quality, durable prints provide scratch resistance comparable to hard-solvent inks. Print high quality images and with eco standards in any textiles with the new Water-based HP Latex 365. Also you can increase production time and efficiency with automated double-sided banner printing, reach production speeds and avoid wait time with continuous printing. Building on years of third-generation the best-selling sign and display printers ever are back with all-new technology assets. 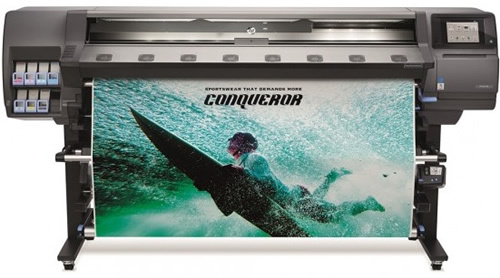 The new HP Latex 365 Printer delivers high image quality, productivity and durability, as well as environmental benefits and industry certifications, all now synonymous with water-based HP Latex Ink Technology. Print on traditional signage substrates and beyond - up to 1.63m (64in)—print textiles with the ink collector. Reach new indoor spaces that solvent can’t, like healthcare - water-based HP Latex Ink prints are odorless. Enjoy efficient, automated double-sided banner printing. Print on traditional signage substrates and beyond - up to 1.63m (64in) - print textiles with the ink collector. >Save time - HP Custom Substrate Pro ling and i1 embedded pectrophotometer make ICC pro ling automatic. High quality at high speeds - 31m2 (334 ft2)/hr high-speed outdoor quality with HP OMAS, HP Latex Optimizer. Gain productivity - reduce time between jobs with continuous printing. Minimize damage risk - scratch resistance is comparable to hard-solvent inks on SAV and PVC banner. Reach production speeds and avoid wait time - prints come out completely dry and ready to finish and deliver. Increase production time and reduce time monitoring the printer - automatic, reliable, low-maintenance printing. Save time - HP Custom Substrate Profiling and i1 embedded spectrophotometer make ICC profiling automatic. The HP Latex 365 Printer features a number of significant innovations that take you beyond the limits of eco-solvent printing, creating new opportunities to expand your business.